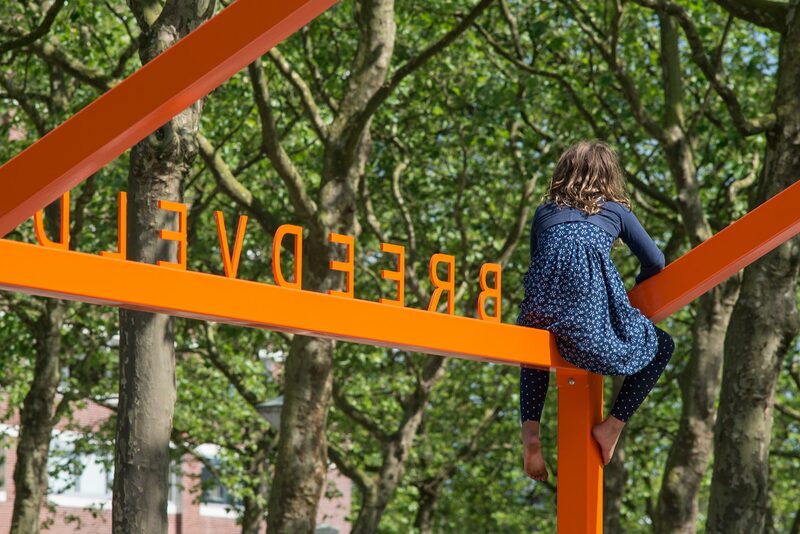 Het Breed is a modernist neighbourhood defined by rational residential blocks, 5 stories with ‘streets in the sky’ in Amsterdam North designed by the architect Frans Van Gool in 1963. 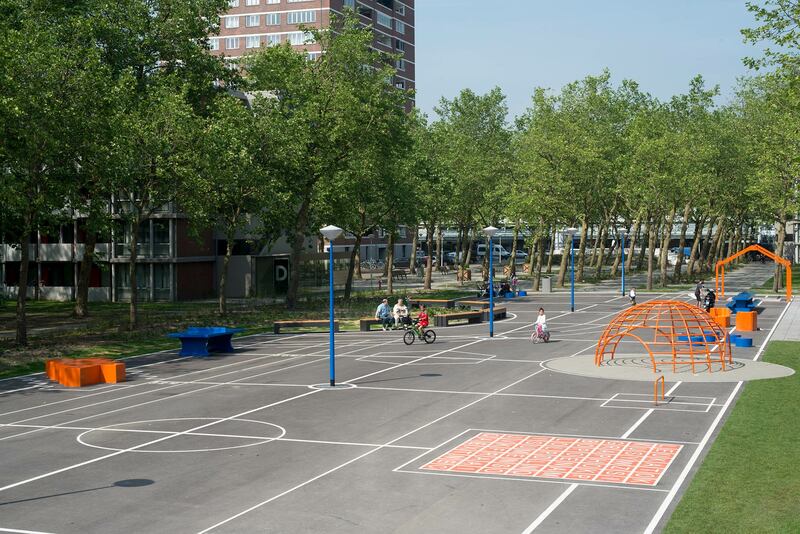 Our proposal ‘Gridgrounds’ creates an elongated public square of 88m x 17m, stretched across the central space so all paths converge here defining a new center for the neighbourhood. 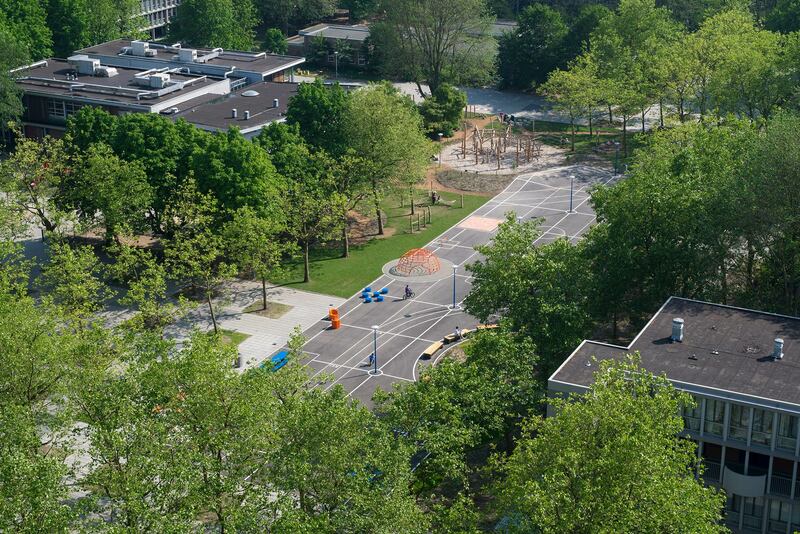 The asphalt square is based upon the original neighbourhood grid and the grid is made visual and tangible through the white marking lines running through the space. 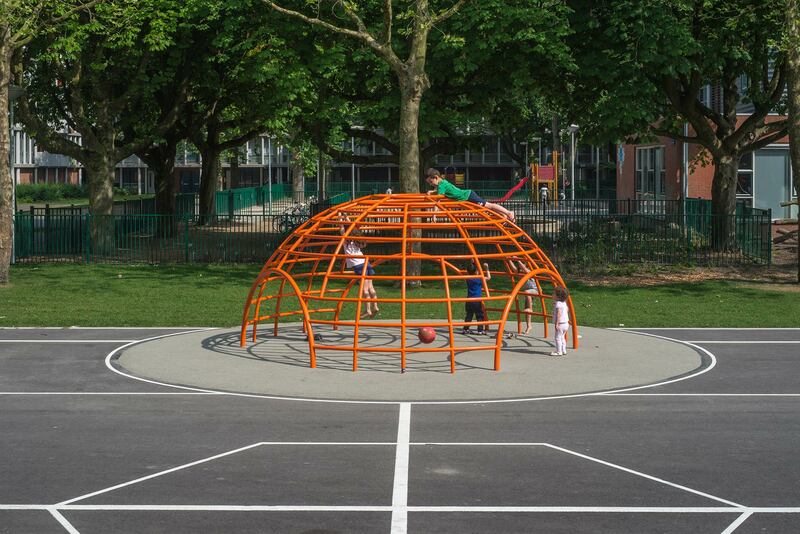 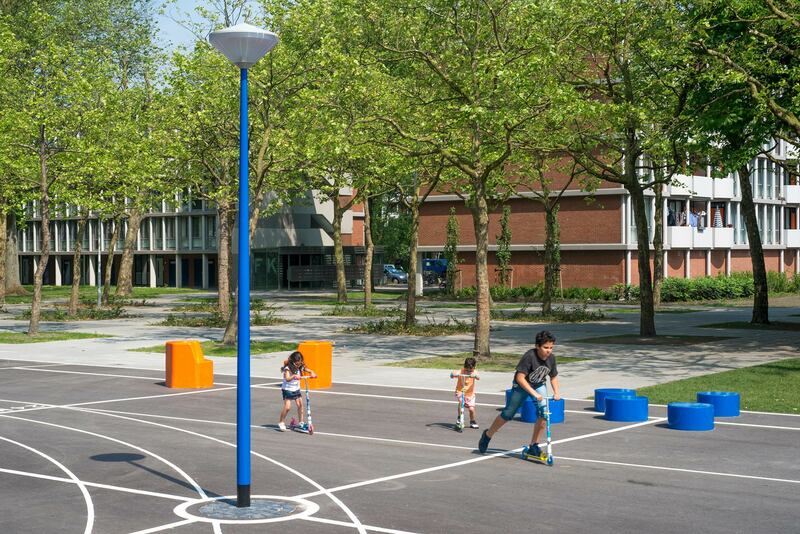 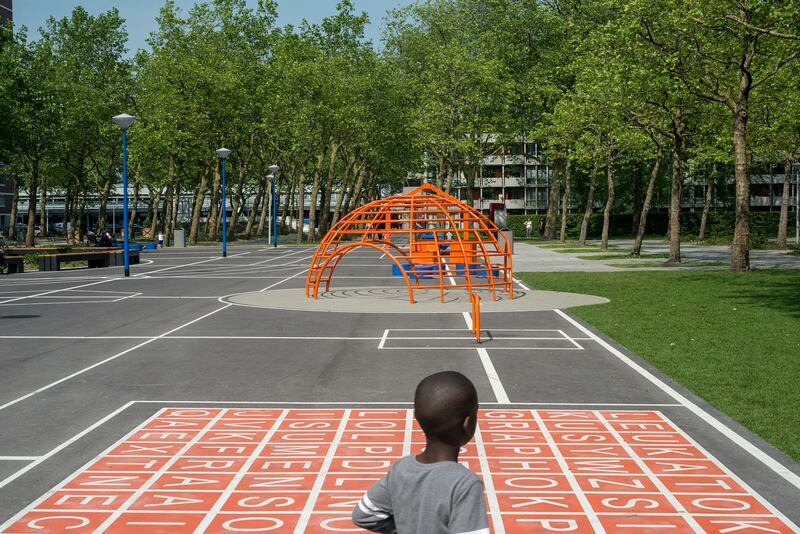 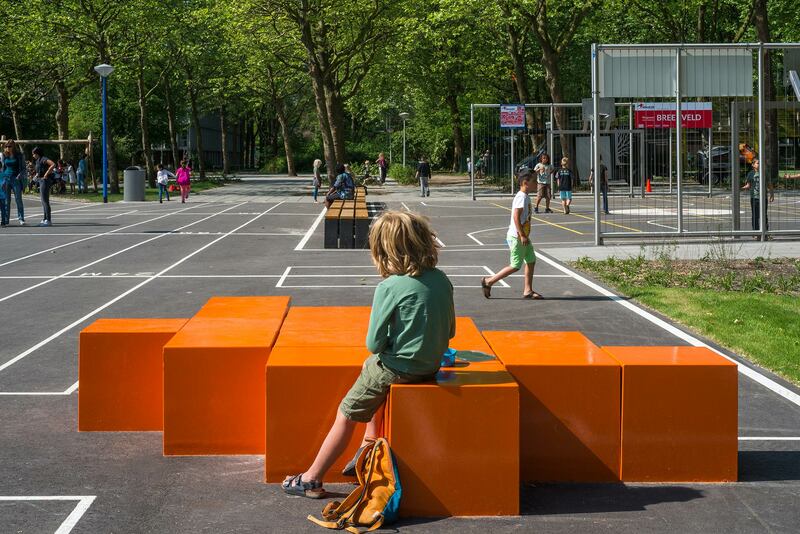 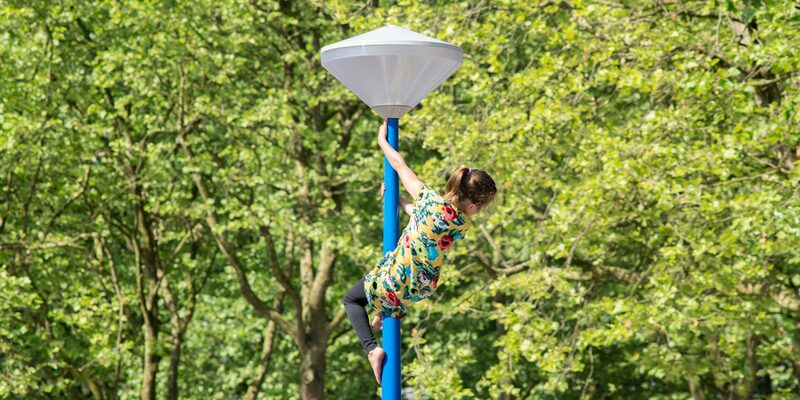 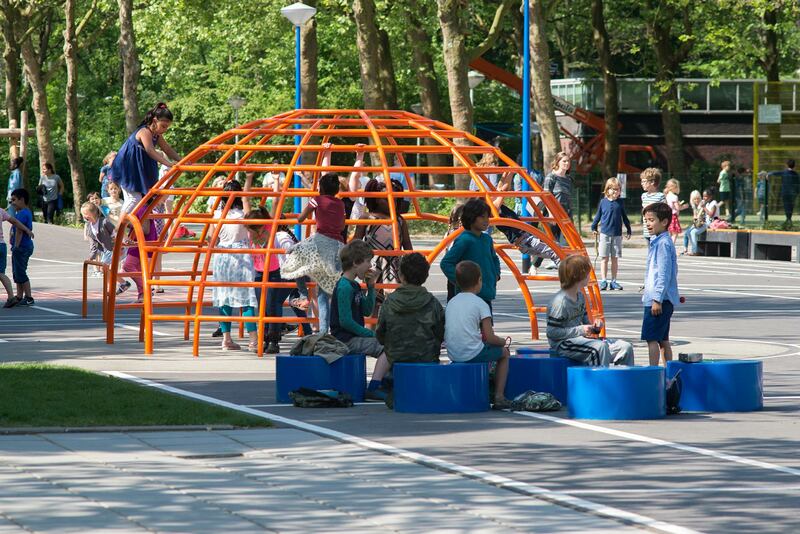 At the points of the grid we placed different play elements in-spired by the modernist playgrounds of Aldo van Eyck in Amsterdam. 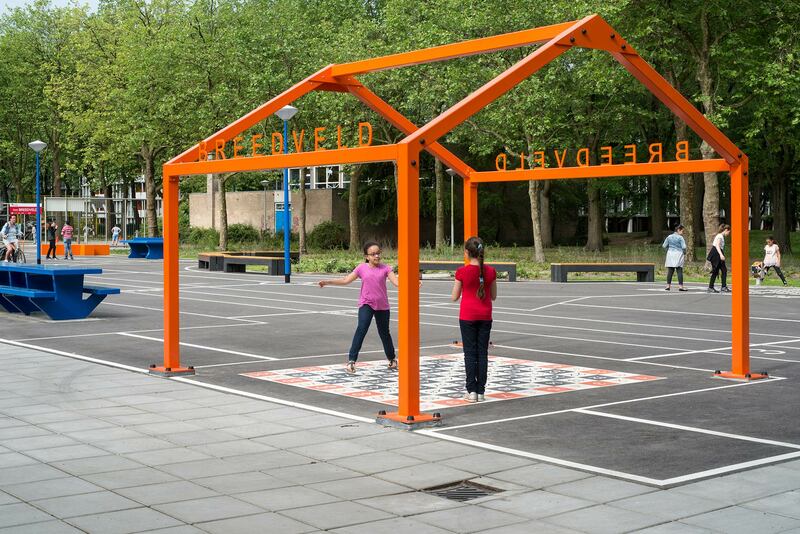 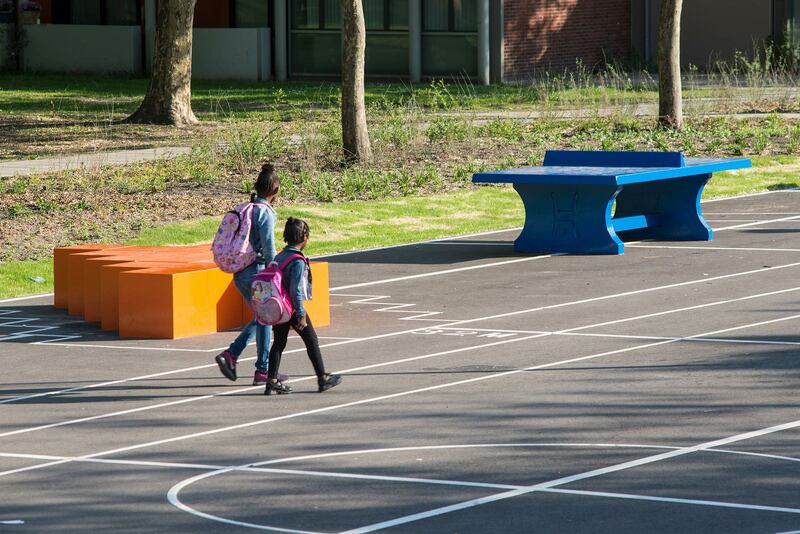 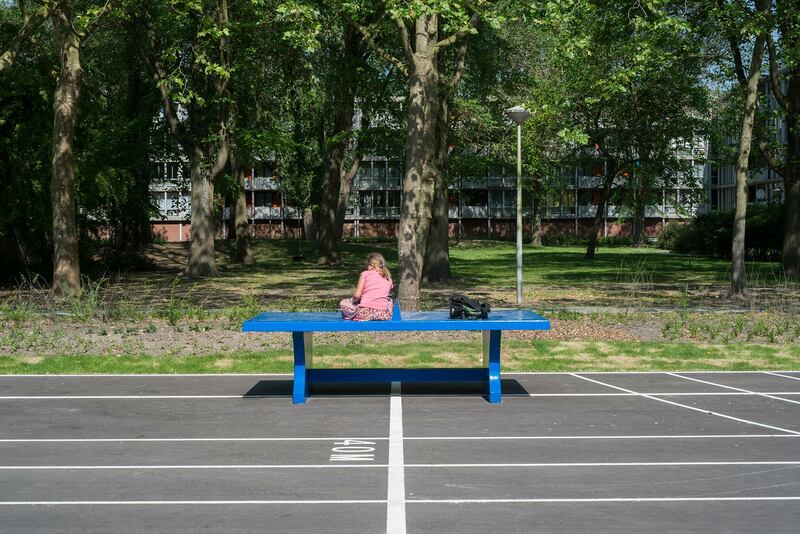 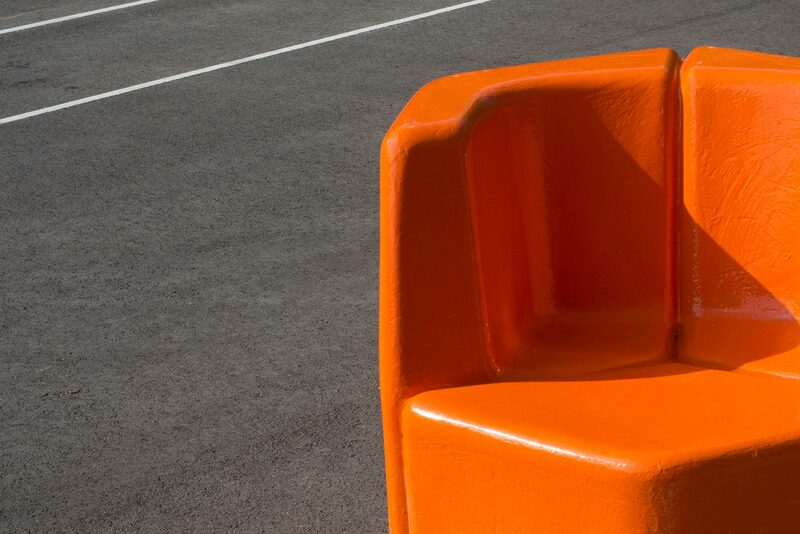 To create coherence all objects are painted Breedveld orange and blue, two colours that have been used in a recent renovation of the adjacent buildings. 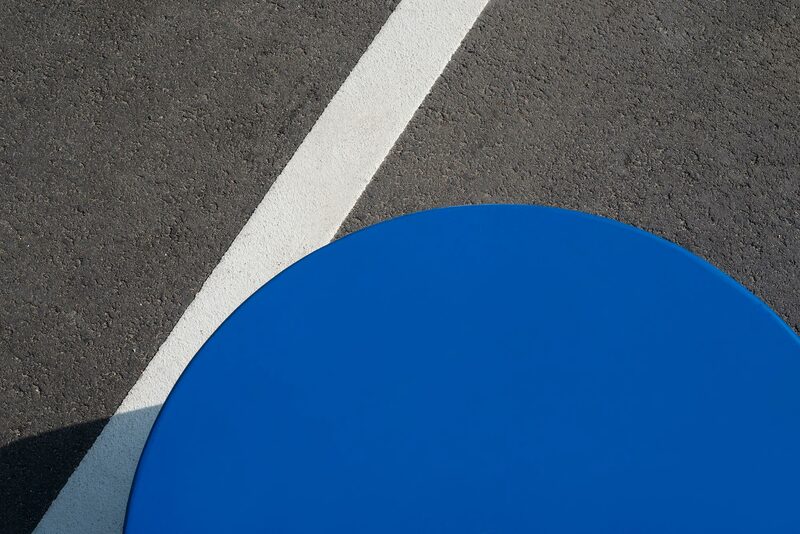 Through the cohesion of the colour, each object achieves a new identity, independent works that collectively form an open-air museum of play elements. 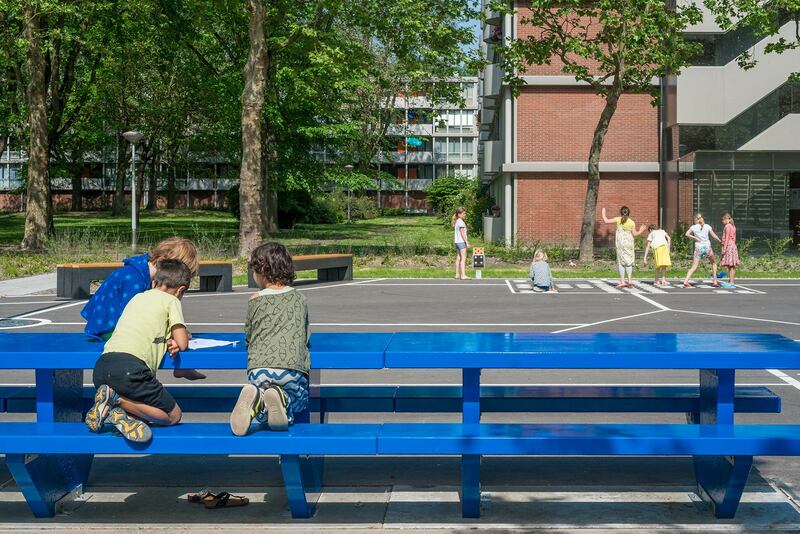 The austerity and monotony of the context is broken by the new playscape while employing the same ele-ments and the layout of the Van Gool plan. 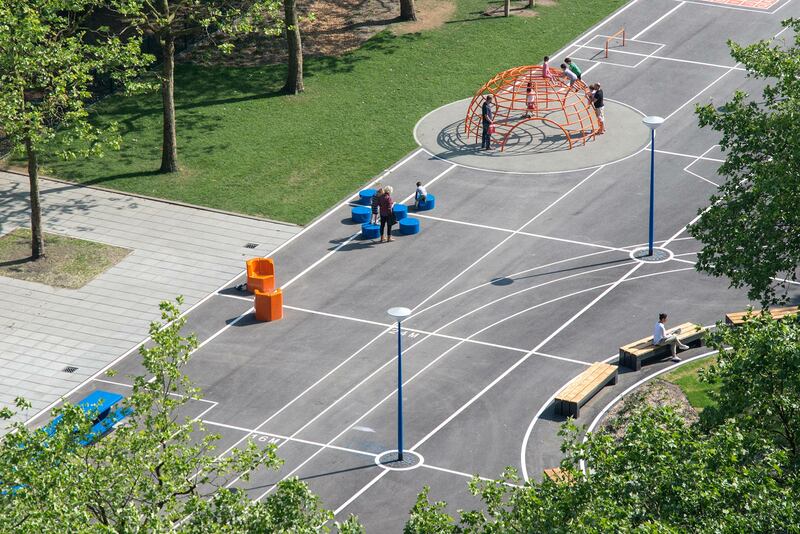 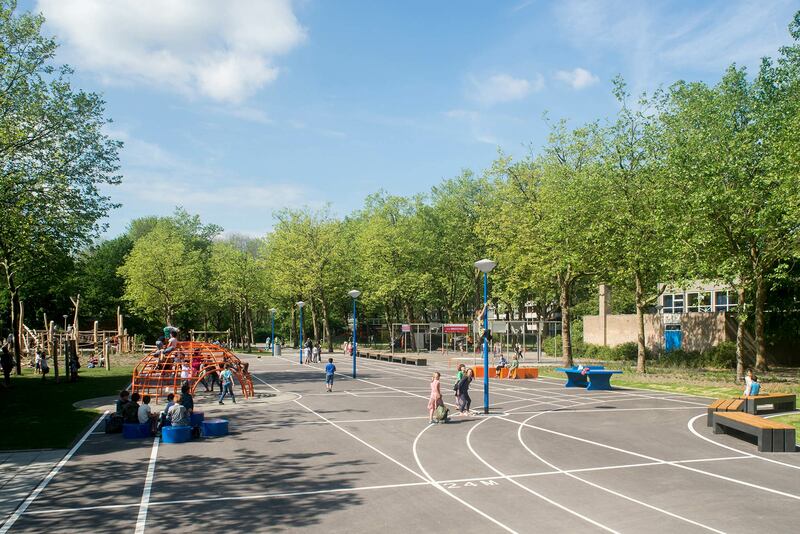 The square is framed by the grid of plane trees and grass and planting along the sides, the rectilinear form is punctured at three points by two green circles (active play space developed with local schools and pas-sive green space that acts as a sustainable drainage point) and a rectangular multifunctional sports court.